Two wonderful classic treasures have come together to create a great addition to any toy collection. Mr. Potato Head follows the yellow brick road to arrive in the Land of Oz. Whether your collection is Mr. Potato Head or the Wizard of Oz, you have the perfect combination. This collection of toys is just plain delightful. The Potato Head Family comes together as Dorothy, who carries her basket with little Toto riding along, the Scarecrow, along with his university diploma, the Tin Man with his heart clock and the Cowardly Lion who proudly wears his medal of courage. These little characters may very well start you off on a new toy collection. Hasbro Toys, the manufacturer of the Mr. Potato Head line, always has great attention to detail. The Dorothy and Friends collection is no different. The characters are full of the extra details that make them so charming. True to Mr. Potato Head, the faces, arms, legs, and extras are all changeable. If you really wanted to, you could create the Cowardly Tin Man. But, with these delightful Wizard of Oz toys, why would you want to? They are smaller than the typical size, only 6 inches, but that just makes them more perfect for your collection. Collecting Mr. Potato Head figures is one of my favorites. Add to that one of my all-time favorite classic movies, The Wizard of Oz, and I have the perfect combination. Oh, yes, you saw right. Mrs. 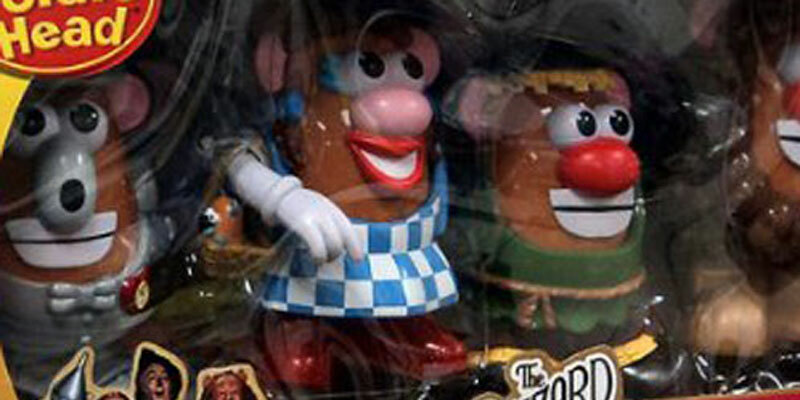 Potato Head becomes the Wicked Witch of the West. A complete and fun addition to your own toy collection. I just had to chuckle when I saw her. The green hands, face and ears are just too cute! Margaret Hamilton, the actress who played the Wicked Witch, had a green tint to her skin for months after filming ended. So Mrs. Potato Head carries that funny theme.